Take vegetable stock in large pan and add soy sauce. Add vinegar,chilli sauce and mix well. Add salad onion and pepper powder to vegetable stock. Put on heat and bring the vegetable stock to boil. Remove froth if formed and let vegetables cooked. Dissolve cornflour in water and add little by little to soup. Let it boil for few minutes and serve with salad onion. 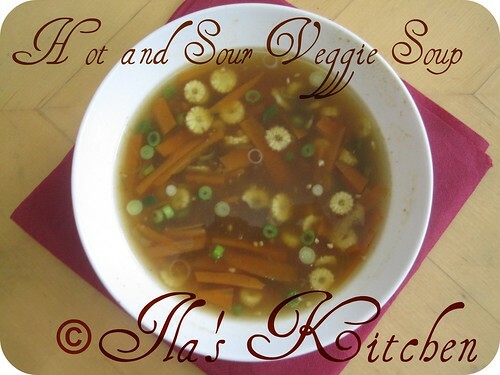 This yummy Hot and Sour Veggie Soup can be served for dinner. It looks very yummy and droolworthy! Slurp! Delicious healthy veggie soup.Happy new year to you and your family. I love soups.. Thanks for posting dear! so healthy and wonderful soup !! This soup looks really tasty.Healthy too.My 1st visit here, you have a nice collection of recipes, following your blog.Do drop by simply.food some time. Delicious soup, would love to grab and finish that bowl rite now..simply irresistible..
Yummy looking soup dear.And wish you and your family a wonderful New Year! 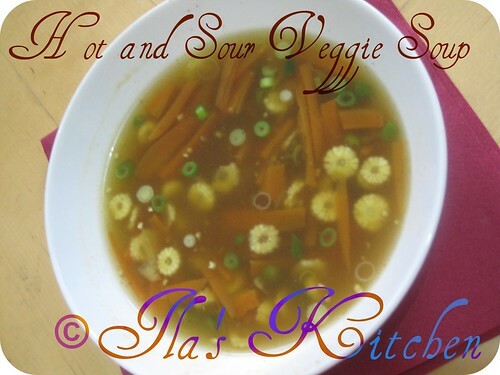 Hot and sour veggie soup looks awesome delicious. It looks very yummy and drool worthy! Slurp! Love the shape (looks like a flower) of the baby corn in the soup..
such a healthy combo. i love soups. this one is drool worthy..